Armpit stains are due to the deodorants and antiperspirants that are used every day. The residues from these, combined with sweat are transferred on to whatever you are wearing. Over time, these deposits build up and cause your clothing to look discoloured and permanently stained. The main offending chemicals are either aluminium chlorohydrate, or aluminium zirconium tetrachlorohydrate gly. These are the most common active ingredients used in most of the antiperspirants and some of the deodorants on the market today. In simple terms, these chemicals block the sweat glands, preventing perspiration. However, if perspiration occurs after application of a product containing either of these chemicals, then the sweat combined with the chemical residue can be absorbed by the fabric in the armpit area of the clothing, leaving deposits. Over time, these deposits can build up, forming stiff or waxy patches and staining clothing. On light coloured clothes, the stains tend to be yellow or brown in colour, and on dark clothing, the stains tend to have a faded or bleached appearance. These stains won’t come out in a normal wash cycle, and boiling, heat exposure and bleaching actually makes them worse! 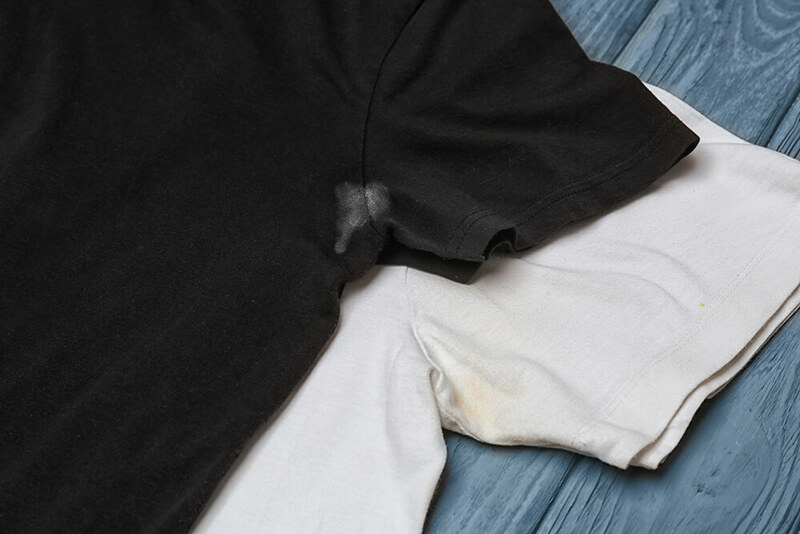 Undershirts, this will stop staining on your outer shirt, but not the undershirt. Before putting on your shirt, let your armpits fully dry after deodorant/antiperspirant application. Avoid applying an excessive amount of antiperspirant. Try using aluminium free or low aluminium antiperspirant or deodorant, these can reduce or even eliminate the residue build-up and the associated staining. There are now antiperspirants on the market which claim to reduce yellow staining. Regular use of propriety stain treatments on the armpit of your clothing may reduce the amount of build up. Don’t tumble dry or iron the armpit area of the clothing if you suspect it has any residue on it, heat can enhance the visibility of the stain.